This image shows one of the first ground sightings of noctilucent clouds in the 2007 season over Budapest, Hungary on June 15, 2007. A rocket experiment set to launch Tuesday aims to createartificial clouds at the outermost layers of Earth's atmosphere. The project, called the Charged Aerosol Release Experiment(CARE), plans to trigger cloud formation around the rocket's exhaust particles.The clouds are intended to simulate naturally-occurring phenomena called noctilucentclouds, which are the highest clouds in the atmosphere. "This is really essentially at the boundaryof space," said Wayne Scales, a scientist at Virginia Tech who willuse computer models to study the physics of the artificial dust cloud as it'sreleased. "Nothing like this has been done before and that?s whyeverybody's really excited about it." 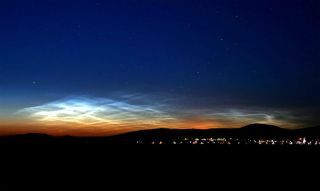 The experiment is the first attempt to create artificialnoctilucent clouds. A previousspacecraft, called Aeronomy of Ice in the Mesosphere (AIM), launched in2007 to observe the natural clouds from space. CARE is slated to launch Tuesday between 7:30 and 7:57 p.m.EDT (2330 and 2357 GMT) from NASA's Wallops Flight Facility in Virginia. Noctilucent means "nightshining" in Latin. Although difficult to spot with the naked eye, theclouds are bestvisible when Earth's surface is in darkness and sunlight from below thehorizon illuminates the high-altitude clouds. These clouds, also known as polar mesospheric clouds, aremade of ice crystals. The natural ones tend to hover around 50 to 55 miles (80to 90 km) above the Earth. CARE will release its dust particles a bit higherthan that, then let them settle back down to a lower altitude. "What the CARE experiment hopes to do is to create anartificial dust layer," Scales told SPACE.com. "Hopefully it's acreation in a controlled sense, which will allow scientists to study differentaspects of it, the turbulence generated on the inside, the distribution of dustparticles and such." CARE is a project of the Naval Research Laboratory and theDepartment of Defense Space Test Program. The spacecraft will launch aboard a NASAfour-stage Black Brant XII suborbital sounding rocket. Scientists will study its progress from ground basedinstruments as well as the STP/NRL STPSat-1 spacecraft in Earth orbit.Researchers will track the CARE dust cloud for days or even months to study itsbehavior and development over time. Because the optical observations are crucial, the launch canonly take place if the weather is clear both at the launch site and at multipleobservation stations along the Atlantic coast and in Bermuda. If CARE cannot launch Tuesday, the team can try againbetween Sept. 16 and Sept. 20.